Click here for entire online catalog. 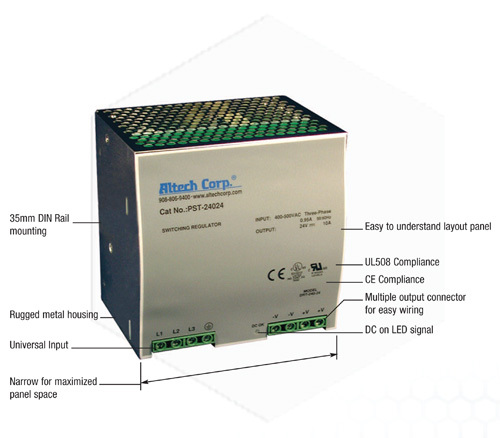 The Altech Industrial metal case power supplies have been optimized for use in practically any DC power applications, with a wide range of AC/DC inputs and an extended temperature range of -20° C up to +70° C. These metal case power supplies feature a small housing design and high power reserve. Excellent electrical specifications and high immunity against fluctuations in input voltage make these metal case modules the best choice to industrial automation. Altech’s metal case power supplies are available in six single-phase and four three-phase models with 12VDC (75W and 120W), 24 VDC and 48VDC output voltages, and up to 40A output currents. This voltage range enables the Industrial metal case supplies to be used in virtually any single-phase or three-phase application. 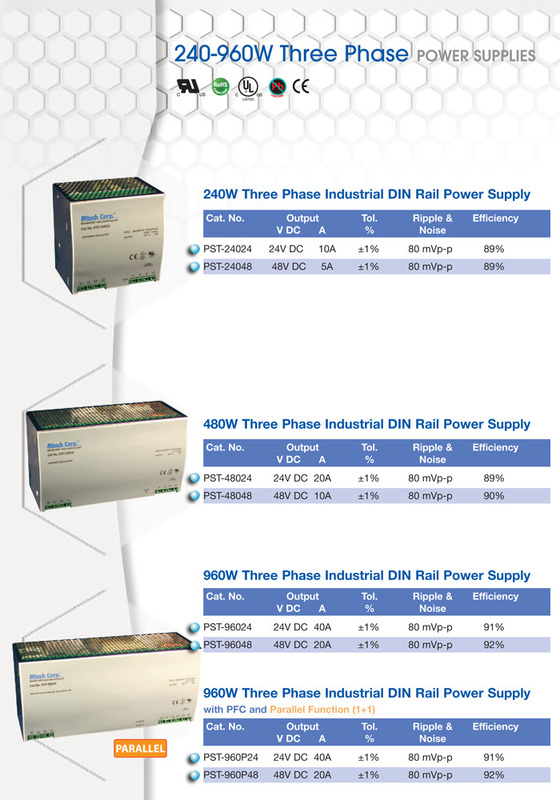 The Industrial metal case power supply series offers users easy wiring with screw terminal blocks and snap-on DIN-rail mounting. Designed for use in numerous applications around the world, this power supplies are UL and CSA approved, CE marked and ROHS compliant. They feature a rugged metal housing, vibration- and shock-proof construction and provide a cost-effective power delivery solution for basic functionality requirements.